The headline sounds like a superhero and the ever-loyal sidekick: Consumer World and Mouse Print. Consumer World is veteran consumer protection expert Edgar Dworsky's original site (no RSS field, but easy email newsletter subscription). Mouse Print is the Massachusetts-based writer's entertaining blog covering the tiny print on consumer packaging and advertising. 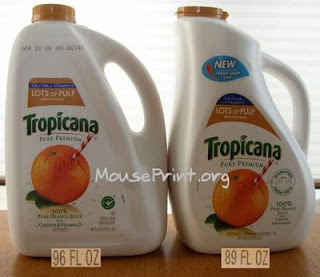 The blog has been having fun lately with package downsizing for food and beverage products. Here is the recent coverage for orange juice. Hooray for the Waltham Fields Community Farm, and for a sunny weekend afternoon at the farm's fundraiser with the marvelous inter-generational Family Folk Chorale. 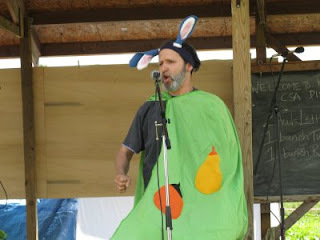 Hooray for Captain Vegetable, who brought a smile to my children's faces. Hooray for the community and traditions of local farms and local food. At Half Changed World, Elizabeth is doing a real food stamp challenge -- genuinely reflecting on the cost of food instead of seeking confirmation for an expected outcome. It gives her a lot to think about. First, most people on Food Stamps are working, and thus receive less than the maximum monthly benefit. In theory, Food Stamps aren't supposed to pay for all their food -- they're supposed to use some of their cash income for food as well. But low-income families have many other demands on their income (if I remember correctly, about half are spending 50 percent or more of their income just on housing). Food is the easiest part of the budget to squeeze, particularly if you're willing to invest the time in going to food pantries. Second, we have a car, and so can travel to low-cost supermarkets and warehouse stores. And we can have enough cash to buy large quantities when they're on sale. Third, we're eating very little meat, and relatively little processed food. We often make a big batch of pancakes or waffles on the weekend, and reheat them for breakfast all week, which is a lot cheaper than breakfast cereal. I think nobody would find the Thrifty Food Plan to be a permissive food budget. Some would find it adequate, and some not even adequate. But here is the hard policy question -- hard even to ask without seeming heartless. If the Thrifty Food Plan is adequate for many, but not all, then should the maximum food stamp budget be raised? The Thrifty Food Plan, and hence the program benefit, are already indexed for food price inflation (though the adjustment lags during a particularly inflationary year, such as the current one). What makes the question difficult is that the Food Stamp Program does two things: (a) it provides resources to low-income people, and (b) it insists that by law the program participant may not spend those resources on anything other than grocery food, even if the participant's own judgment is that she needs to spend only part of those resources on food. How much would a change in ethanol policy affect corn prices? Here is the story from one of the most authoritative sources in agricultural economics, the Center for Agricultural and Rural Development at Iowa State University. In a working paper (.pdf) released this month, Lihong Lu McPhail and Bruce Babcock consider the impact of three policy changes: (1) removing the Renewable Fuel Standards, which mandate that a certain fraction of fuel comes from ethanol, (2) removing the blenders tax credit, a direct tax subsidy to blenders, and (3) removing the tariff on imported ethanol, which encourages the conversion of U.S. corn to ethanol by keeping domestic ethanol prices high. Eliminating any one of the policies would reduce average corn prices by less than 4%. Removal of all three programs would decrease average corn prices by 14.5%. The reason why the changes are relatively modest is that existing U.S. ethanol plants will only shut down if their variable cost of production is not covered. Changes in ethanol policies would have large distributional impacts. Corn growers, ethanol producers, and fuel consumers have a large incentive to maintain high ethanol consumption. Gasoline producers have a large incentive to reduce ethanol production and imports. Livestock producers have a large short-run incentive to reduce domestic ethanol production. The authors plan future work to consider the corn and soybean markets jointly, and to lengthen the time period focus. I would add that 14.5% seems like too big a price reduction to dismiss lightly. Also, the authors explain that ethanol plants will keep operating even if they are failing to pay for themselves, so long as their sales cover at least their variable costs (such as purchases of inputs). But, the investments in the plants themselves were in many cases also subsidized by the federal government, so the impact of federal policies has almost certainly been to raise corn prices by more than 14.5%, and in the midst of an unusual price spike to boot. For further reading, the Environmental Working Group has just released a blistering report on ethanol policies (see coverage at Mulch). In the engaging and insightful documentary King Corn (trailer from YouTube below), college friends Ian Cheney and Curt Ellis use their year of experience farming an acre of corn in Iowa as the frame on which to hang a wider exploration of the U.S. food system. I finally watched King Corn last week after missing it in the theaters and waiting for it from Netflix. I should have seen it sooner. There's a lot to like. Cheney and Ellis are charming stand-ins for the film viewer, looking with astonishment on an industrial system few people understand. The film overcomes gimmickry in part through excellent interviews with Ken Cook, Michael Pollan, an agronomist, a corn syrup industry public relations person, and more. The interview with former Agriculture Secretary Earl Butz, prophet of the agriculture motto "get big or get out," is of considerable historical interest. This interview reminded me of Michael Moore's interview with Charlton Heston in Bowling for Columbine, but Cheney and Ellis are kinder to their host. A tour of urban neighborhoods, chaperoned by a fellow who grew up in the neighborhood and who lost a parent to diabetes, extends the film's scope beyond the heartland and increases its relevance to audiences anywhere in the country. The film is clever in its use of visuals to communicate complicated information, such as hand-drawn bar graphs that provide substantial quantitative detail without breaking the film's rustic tone, and funny animations using a toy farm to illustrate the agriculture system's interrelationships. The Boston Globe's rave review points out that the film's gentle tone makes easier watching than Super Size Me or Michael Moore's work, but without subtracting from the film's motivational impact. Interesting post and thread, Alex. On food safety issues, I try to ignore the ideologues. On the one hand, Grover Norquist and Milton Friedman have hopes for market incentives that are not only unrealistic, they are very far from the current state of good contemporary economic thought on food safety. On the other hand, I give little weight to critics who hold out unrealistic expectations for government prevention of all food safety risks, not so much because they care about food safety, but because they just have large ambitions for government interventions in the economy. Current economic thought draws on a fairly specific diagnosis of different kinds of imperfect information, each of which calls for a different policy response, which can range from laissez faire to labeling to testing to regulation. A standard mainstream -- or even somewhat conservative -- text on the economics of food safety is John Antle's book on food safety. It acknowledges market failures in food safety, and particularly recognizes the need for strong government regulation of food-borne pathogens, because in many cases consumers cannot recognize the safety of the food even after purchase, and hence cannot defend their own interests in the marketplace. In my reading, Antle is a strong critic of food safety activists on other topics, such as pesticides (where he believes there is over regulation disproportionate to risk), but on foodborne disease he seems to me closer to Krugman than Friedman. There are some exciting private market innovations in food safety recently. For example, the buyers for major supermarket chains are getting more sophisticated in demanding safety from their suppliers, which allows the market to achieve good outcomes that individual consumers could not command on their own. At the same time, it is fair to say USDA and FDA oversight of food safety have fallen far short of a balanced position. The CDC stats on outbreaks have a number of shortcomings, and don't suffice to make me think otherwise. Take something like the USDA's refusal to let Creekstone beef voluntarily test its own product for BSE. It is so outrageous that the J. Thomas in his comments even presumes it to be untrue (it's true). The so-called "regulators" are way out of step with the public interest position of economists, even market economists who appreciate the market's accomplishments on its good days. Do something great for the environment that has nothing to do with pretzel-shaped light bulbs, new bushes on the South side of your home, flip-flops made from recycled tires, or tabulating food miles. In your next conversation with a friend or family member about the price of gasoline, mention in passing that you LOVE the new prices. If we bike more, use trains more, avoid airplanes more, and walk more, we will enjoy life more. What fun, you may ask, is there in riding a crowded subway train, as more and more people are reluctantly doing lately? Tons! The other day, I looked around for a strange human muttering or humming sound, barely audible above the screeching rails. "Person in need of medication?," I wondered. Not at all. It was a small man sitting squished against larger strangers, with his eyes peacefully closed, quietly singing some kind of chant, perhaps Tibetan or Central Asian. The small number of people within listening distance broke the silly urban taboo against making eye contact and enjoyed the rest of our ride communally, as our singer gently guided our thoughts out from the subway tumult and toward the divine. Yesterday, after biking the mile and a half to Alewife station, I was told before boarding that the line was shut down altogether for a while, due to fire department activity at a later station, and everybody would have to wait in line for a bus shuttle. That's the worst thing about public transport, right? After getting back on my bike, instead of the shuttle, and riding along the Charles River in the morning sunlight to my office downtown, I wished I had time to keep riding. When was the last time you parked your car at your work in the morning and wished you could do the journey again? 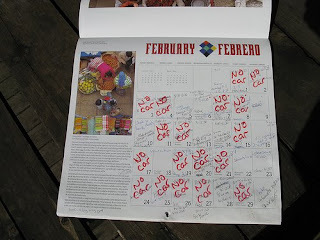 My family of four, including children now aged six and seven, just finished about fifteen months of a low-car-use discipline (described in an earlier post and in the Boston Globe suburban edition last year), where we marked a calendar in red for each day that we didn't use our one beat up old Honda. We ended up using the car about 12 days a month, and even then mostly for short trips. The kids are accustomed to walking or biking to school, church, friends' houses, sports practice and games. We saved not just on gasoline and auto maintenance, but also got a 5% discount from our car insurer due to low mileage. At a conference of activists this spring, I attended a session on the food system and global warming. As participants brainstormed a long list of things the sustainable food movement could do to address global warming, I suggested, "Speak well of high gasoline prices." The suggestion was a dud. Even organic farmers must pay for fuel, and it is hard to like high prices. It is challenging to shift our attention beyond the income effect of a price increase, and instead focus on the wise signal the new price sends to millions of resource decision makers throughout the economy. To take just one example, high fuel prices annoy the environmentally sustainable farmer, but they really sting for an industrial farmer. The high prices improve the competitive position of the sustainable farmer. If the world's best scientists are right, the lifestyle changes that people are making this year, in the face of high gasoline prices, are essential to the future environment for our children and their children. But the scientists cannot say whether that low-fossil-fuels future is tolerable or bleak. That decision depends not so much on science, but on our attitude. The trick to maintaining a constant gasoline budget, even in the face of new prices, is to reduce gasoline use. The fun challenge is to reduce gasoline use, and yet find yourself living more richly. Evidently, in Michigan -- a state undergoing severe economic strain -- some bureaucrats have bought into the whole notion that organic food is a luxury for the elite. Mothers using WIC in Michigan have to be especially careful about eggs. Avoiding organic eggs is only the beginning. Other no-nos include ones that are free-range, cage-free, or enhanced with Omega-3-rich feed. And get this: The eggs have to be white! I reached Tom's article from a link on Ashley Colpaart's new blog, Epicurean Ideal. Tom points out in his comment section that the most likely reason for the Michigan policy is concern about cost, rather than prejudice against organics per se. 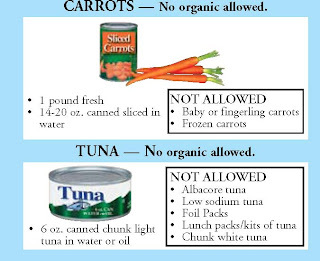 But the Michigan brochure's tuna gaffe and the high profile for the repeated "no organic allowed" warning, more prominent than other limitations mentioned in the rules, makes me wonder. ABC News last month offered a sharp, concise summary of the environmental case for eating 20 percent less meat. It draws on a collection of research outlined in the UN report, Livestock's Long Shadow. Jeff Poor of the Business & Media institute has an almost helpless non-rebuttal to the ABC News piece. Poor has nothing to say on the substance of the case, but argues that there would be dire economic consequences. For support, he links to a brief (.doc) by Dan Otto and John Lawrence on the National Cattlemen's Beef Association website. With world markets at their current positions, Poor has a tough time raising the reader's fears of insufficient food demand. Anna Lappé and the Small Planet Institute have a new related project, Take a Bite Out of Climate Change. I found most of the links in this post at their new blog, which is now added to the sidebar. As an aside, I have been enjoying Lappé's 2006 book with Bryant Terry, Grub, which reminds me of Barbara Kingsolver's book in its combination of food system criticism and constructive menus and advice. Far from being pedantic in their environmentalism, Lappé and Terry make eating organically and locally seem totally fun. The menus are organized by season, accompanied by cool "soundtrack" recommendations for music to enjoy while cooking and eating.